Looking for a little something to give your father for Father's Day, or maybe just something to show him that you appreciate him and all he does? Look no further than this delightful keychain. The simple design is made out of stainless steel and features a brushed finish for that little extra oomph when being observed. Featured on it is the word "DAD" laser etched to perfection. This keychain will be the perfect little something to give your father for any occasion, and with its durability, it's sure to last for a very long time and remind him of your appreciation every time he takes it out and remembers who gave it to him. 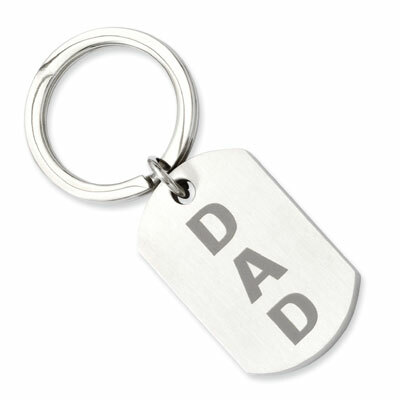 Show you dad your love by getting him this stainless steel keychain. Keychain has a brushed finish. Keychain measures 40mm (1 9/16") x 25mm (1") not including key ring. We guarantee our Dad Engraved Stainless Steel Key Ring to be high quality, authentic jewelry, as described above.